PASCAGOULA, Miss., Nov. 30, 2012 (GLOBE NEWSWIRE) -- Huntington Ingalls Industries (NYSE:HII) hosted Chief of Naval Operations (CNO) Adm. Jonathan W. Greenert at the company's Ingalls Shipbuilding division on Thursday. 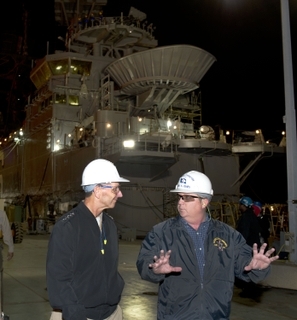 Adm. Greenert met with company leadership and toured the amphibious assault ship America (LHA 6). "We're at Ingalls to see the home of shipbuilding for amphibious ships," Adm. Greenert said. "Shipbuilding is our future, and it's the Navy's future, and clearly Ingalls is a major part of that. We have to understand how to build effective and efficient ships. For me as the individual who determines the requirements, I want to have a discussion and see what's feasible in the out years. When it comes to future ships, we're looking for efficiency and flexibility. Platforms that can take on payloads and be able to stretch, evolve and transition to a future Navy." Adm. Greenert spent time meeting with Ingalls Shipbuilding President Irwin F. Edenzon before being given a short tour of the facility as well as a briefing on-board America. "All Ingalls Shipbuilders appreciate the time Adm. Greenert spent with us today," Edenzon said. "His personal interest in our shipbuilders and our shipyard reinforces how important our industry is to maintaining a strong Navy. We do hard stuff right, and I was proud to show the admiral how committed we are to doing it right and doing it better every day."